This past weekend I met up with a friend of mine who just bought a new camera and was showing it off. I happen to be in the market for a camera, since I would like to take some good pictures and possibly video of the cottage as I build it and post them on the blog. To do this I want to make sure the pictures and video are good quality. My friend tells me this camera produces HD output and only costs $400 US! My interest is peaked immediately. He hands me the Sony Cybershot DSC-T100 8.1Megapixel 35mm digital camera. Weighing only 6.1 ounces and less then an inch thick it easily can be carried in a pocket. 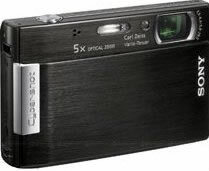 The front has a slide down “lens cap” that exposes the lens and flash that is common to the Cybershot series of cameras. The back of the camera is almost entirely taken up with the 3 inch LCD screen. There is no manual viewfinder. A strip beside the LCD screen houses the zoom and menu controls. The menu software is incredibly clear and easy to use. There are 9 scene modes that let the user compose their shot as best they can without having an SLR. There is also 6 different white balance settings to eliminate the odd colours when taking shots indoors and out. The T100 has a 5x optical zoom going from 35mm to 175mm. The focus settings allow for macro shots and magnifying glass shots, which is like a super macro option. The biggest feature and is apparently the hottest thing for point and shoot cameras is the face recognition feature. The Sony T100 can identify up to 8 faces at once. This feature ensures that the proper lighting and exposure are used on each face to achieve professional looking portraits. I can’t vouch for the feature since I haven’t printed anything off, but it sure is a step in the right direction for point and shoot cameras. The camera comes with standard definition cables to output to your TV or computer, but HD cables are available at an extra cost. Stored pictures can be played back on a TV with MP3’s to make an enjoyable slideshow for your guests. Again at only $400 US to have that quality of pictures and video along with all the other features I can’t see any reason to buy a camera and a video camera. This one does it all and I’ll be purchasing one shortly.